Does making pie (especially pie crust) scare you? Do you not like rolling out pie crust dough or making complicate pie fillings? 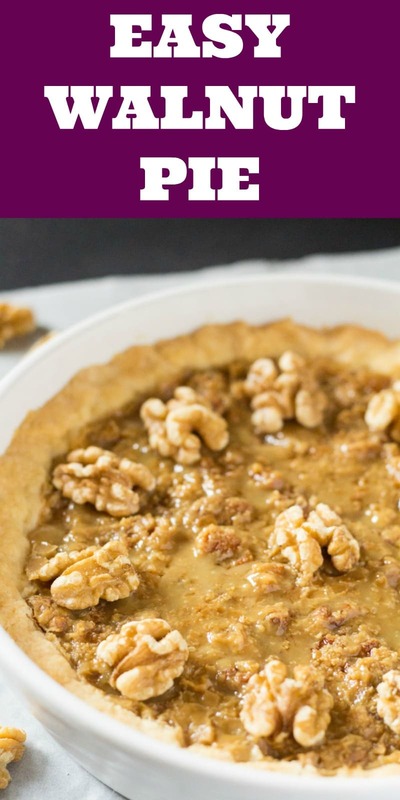 Then this delicious Walnut Pie is the perfect pie for you! The pie crust is super simple to make (no rolling involved) and the filling is super delicious and easy as well. If you like making easy desserts, you’ll also love Red Velvet Crinkle Cookies and Reese’s Triple Chocolate Bundt Cake. The whole internet is full of pumpkin pie and pecan pie recipes. So I decided there should be a different type of pie in all the pie madness and that’s how this walnut pie came about. Actually this walnut pie is a family friend’s recipe and we’ve been making this walnut pie for years!! The filling is insanely delicious. I bet you won’t be able to stop eating it. And fine, this walnut pie is not the prettiest of all the pies in the world. But you know what really counts? The inside beauty (or taste, in this matter) is what really counts. And I can assure you, this walnut pie is gorgeous from the inside. Lol. Let’s talk about this pie a bit. Especially the pie crust. So I have a confession to make. I don’t like making pie crusts because I feel they are very fussy to deal with and are often too high maintenance. And if you’re a regular reader around here, you know that I don’t do high maintenance recipes at all. The creamy caramel walnut filling is also very easy and only requires three ingredients: walnuts, (obviously! ), heavy cream and sugar. 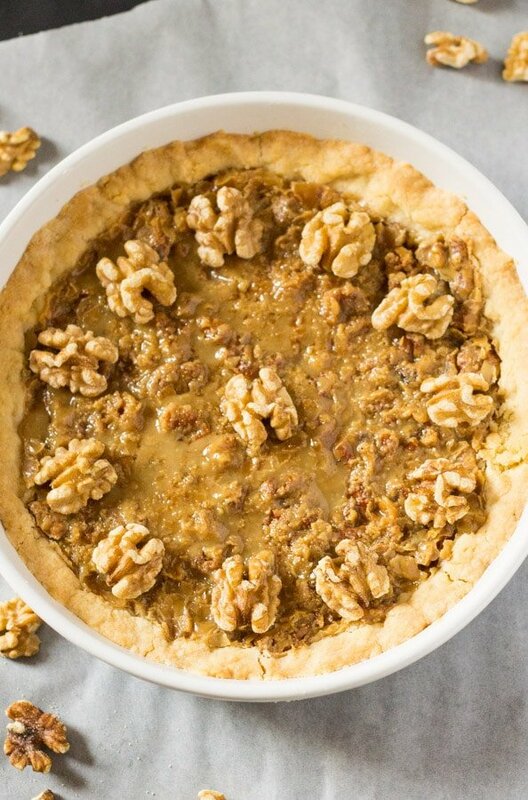 How Do You Make Walnut Pie? There are two parts to every pie, the pie crust and the filling. This easy pie crust is made with just a handful of ingredients: flour, sugar, baking powder, oil and egg. There’s absolutely nothing complicated about this pie crust, I guarantee you. All you have to do is whisk together the dry ingredients, then add in the oil and egg and mix until combined. And here comes the easiest part, you just need to press the pie crust into a baking dish and that’s it. I used a 9 inch round baking dish. This pie crust is crumbly, and sort of similar to the texture of a softer shortcrust biscuit, and combined with the walnut filling, it is mind blowingly delicious. Okay so I have three words for you: walnuts, heavy cream and sugar. Add all of these ingredients to a medium sized saucepan and cook for 15-20 minutes until it becomes a caramely mixture, and I predict that you will want to take a taste, and while I would do the same, just make sure that you don’t burn your tongue! Now all you have to do is add the filling to the prepared pie crust, and baaaake. 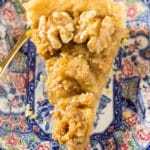 So while I may not have presented with you a traditional pie today, I do guarantee that this Easy Walnut Pie will be regularly featured in your baking escapades after you take that first warm, ooey gooey bite of this pie. 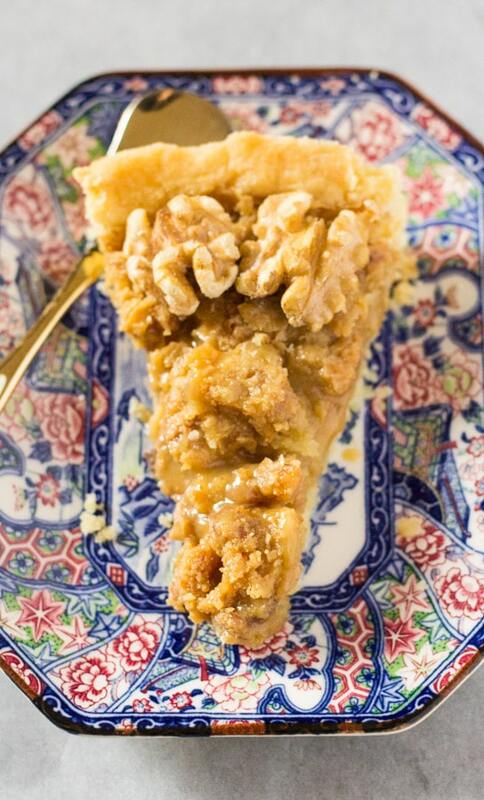 This easy walnut pie is the perfect dessert for winter months, and so easy to make as well. The pie crust comes together in no time, and the filling requires only three simple ingredients. Preheat oven to 150 c and prepare a 9 inch round baking dish by greasing it with cooking spray. Place the walnuts, heavy cream and sugar in a medium sized saucepan, and cook on medium high heat. Keep stirring for about 20 minutes, until the filling has thickened up and is golden brown in color, like the color you see in the pictures above. Set aside. Whisk together the dry ingredients: flour, icing sugar and baking powder. Add in the egg and oil, and mix until combined and the mixture looks like a dough. Press into the baking dish, making sure it is evenly spread and also press up the edges of the baking dish. Pour in the walnut filling onto the prepared baking dish, and bake for 30 minutes until the edges of the crust are golden brown. « Jeera Rice – Only 3 Ingredients! Can we use malai if full cream is not available.